NC500 Fishing - Best Trout Lochs & Rivers in South and East Sutherland. A huge loch, 17 miles (27km) in length, running NW-SE. Trout are typically ½ to ¾lb, but there are also much larger ferox trout caught regularly. Fly fishing is the norm, but spinning and bait fishing are also allowed. Boat and bank fishing are permitted. Petrol outboards are recommended. Access to all of these lochs is controlled by Lairg Angling Club. Trout in these lochs average ¾lb, with occasional fish caught up to 2lbs. Fly only, electric motors permitted. 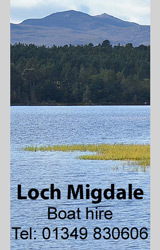 Loch Migdale is a large tree-lined loch lying above the village of Bonar Bridge at the western end of the Dornoch Firth. The loch runs broadly east-west for a total length of 1.8 miles (2.9 km), providing long drifts along the north & south shores. Abundant trout, typically ½ to ¾lb in size. Boat hire from TroutQuest, Tel: 01349 830606. These lochs are clustered on the hills above Bonar Bridge and are controlled by KoSAA. Loch Buidhe has roadside access, and both boat and bank fishing are permitted. Trout average ½lb. Cracail Mor requires a 1.5 miles 'walk in', but holds good quality trout averaging ¾lb, and up to 2lbs. These two remote hill lochs lie to the north-west of Dornoch, and are managed by Dornoch AC. Access is via a gravel vehicle track. In addition to the small native brown trout, the club also stocks Laiogh with a few larger browns, and Lannsaidh with rainbow trout, typically in the 1-2lb range.